AIAS > News > Uncategorized > Welcome to Spring 2019 Membership Month! Last Fall, we challenged our members to reach inward and find their inner success seekers. You responded by showing that the value our organization brings comes from the passion and drive of each of its members. When we are each stronger, we are all stronger, and when we are all stronger, we are each stronger. Now it’s time to reach outward and become “success sharers”. This Spring Membership Month, we challenge you to reach outward and promote all the ways you or your chapter have found success. We want to help YOU share and learn from each other’s best practices. The National Office will be making full use of our Instagram presence throughout Spring Membership Month to maximize the visibility of your efforts. Each week, select chapters will have the opportunity to “take over” the AIAS National Instagram account (@aiasorg) for a day and be given a platform for sharing their successful strategies, initiatives, tips, and tricks. Reaching outward also means sharing the many benefits of joining the AIAS and grasping success through your chapter’s membership growth. Dispel the notion that “it’s too late to join now” by highlighting all of the value still to come over the next six months. 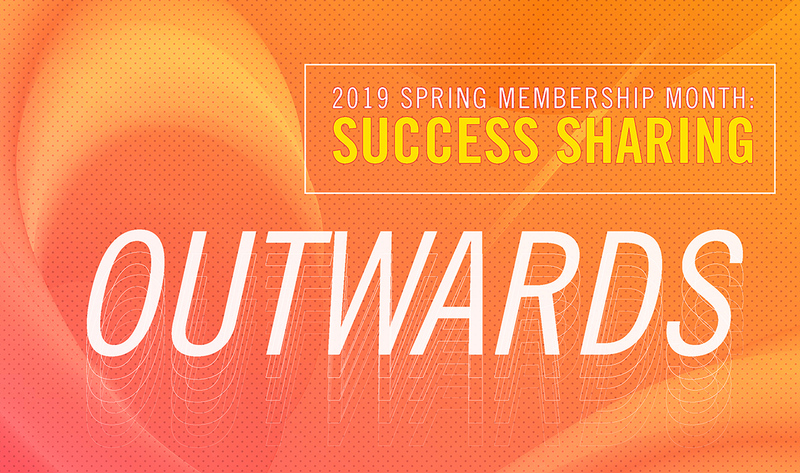 Members save on attending upcoming Spring events such as Quad conferences, CRIT Live, and THRIVE as well as the 2019 Grassroots Leadership Conference in Washington, D.C. this July. This, along with the abundance of national and local programming members can take part in, makes joining now a great value. And at the newly-reduced membership rate of $32, the value has never been so visible! Keep an eye out for your fellow Chapters’ success stories and think about how your chapter has found success. AIAS National will be compiling your stories and resources to provide future chapter leaders with a robust compilation of success strategies. Remember to tag @aiasorg and use the hashtags #AIASmem19, #SuccessSeeking, #SuccessSharing, #AIASleadership, #AIASdesign, #AIASservice in your posts for maximum visibility!